The full-size pickup war between the Detroit Three (Ford, General Motors, and FCA) has heated up to an all-time high at the Detroit Auto Show, as all three automakers unveiled either all-new or refreshed pickups. Not to be outdone by its rivals, Ram recently took the cover off of its all-new 1500, which now comes with more technology and an upscale interior. There’s a host of new technology on the 2019 Ram 1500, which includes a mild-hybrid setup. The 48-volt eTorque system is standard on the 3.6-liter Pentastar V6 engine and is an option on the larger 5.7-liter Hemi V8 motor. Both engines are now paired to an eight-speed automatic transmission. Power outputs for the engine remains the same as the current 1500 – 305 horsepower and 269 pound-feet of torque for the V6 and 395 hp and 410 lb-ft of torque for the larger V8 – but the new eTorque system provides a substantial torque boost to the engines. On V6 models, the mild-hybrid setup adds an additional 90 lb-ft of torque. That figure swells to 130 lb-ft of extra torque for the V8 engine. In addition to providing some extra torque, the 48-volt motor on the accessory drive is in charge of starting and charging the truck, as well as helping it save some fuel by improving the efficiency of the start/stop system. The inside of the Ram 1500 is just as tech-forward with an available and massive 12-inch fully-configurable touchscreen dominating the dash. Those not wanting a screen that rivals some smaller laptops on their pickup truck can go with the standard touchscreen that only measures in at 8.4 inches. The larger screen can split two functions at once – like having Apple CarPlay and the pickup’s HVAC controls up at the same time – or be configured to display one item across the entire screen. 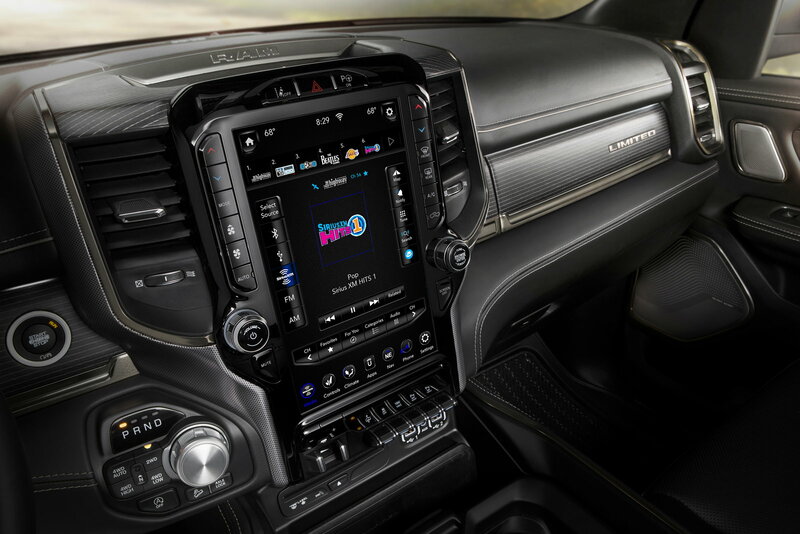 Other interesting features on the inside include a 900-watt Harman Kardon 19-speaker audio system, which Ram claims is the most powerful audio system to ever be put into a pickup truck, an available 360-degree camera system, and five USB ports. Ram didn’t provide a lot of details on the materials on the inside of the new 1500, but claims that bespoke colors and high-end materials adorn each trim level. And the interior should be quiet, as well, with active-tuned mass modules that are mounted onto the frame that help counteract harsh vibrations from the road. Active noise cancellation is also available for pickups with the V8 engine. Safety-forward tech features have also been added to the pickup, as Adaptive Cruise Control with Stop, Go, and Hold, Ford Collision Warning-Plus, Blind-Spot Monitoring, and LaneSense Lane Departure Warning-Plus are all available. 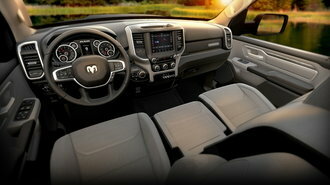 You know times have changed when full-size pickup trucks have tech features that rival that of a luxury sedan. But the Ram 1500 is still good at doing truck-related stuff. Despite the modern exterior and upscale interior, the new pickup is 225 pounds lighter than the outgoing model and has an upgrade high-strength steel frame, which the automaker claims makes it the strongest full-size pickup from the brand ever. Maximum payload capacity for the new truck is 2,300 pounds, while towing capacity is rated to be 12,750 pounds. Prices for the 2019 Ram 1500 are expected to be released before the pickup truck arrives in showrooms later this year. And while information on a diesel powertrain isn’t available at the moment, we expect the automaker to put something out in the near future. With new features that rival luxury cars, pricing for a range-topping model could bring some sticker shock for the new pickup.